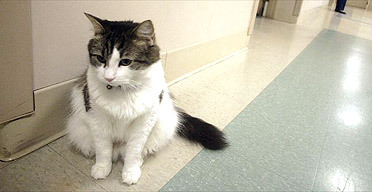 Oscar the Cat, resident at the Steere nursing home, Providence, Rhode Island, has ‘an uncanny ability to predict when nursing home patients are going to die’, according to our old friend the guardian unlimited. What happens is the following: Oscar will generally walk around the nursing home not paying much attention to anyone, purportedly not the friendliest of cats. However!, every now and then Oscar will approach a resident and hang out with them. 25 times in a row this patient has passed away within four hours of Oscar befriending them. So: either Oscar is the grim reaper and his presence in fact causes the subsequent death of said patient OR he is able to sense something, a shift, a movement, just as nurses are able to do so after spending enough time in such a place. The former suggestion is absurd and the latter highly credible; of course, Oscar’s sense seems more highly tuned than that of any nurse. What I find fascinating is not that Oscar can tell such a thing, but that an otherwise unfriendly cat will decide to join someone in their very last hours. And now when Oscar does join a person their family will be called straight away and informed. Only one family member so far has asked Oscar to leave the room for their father’s last moments. And then there’s my concern for the patient, entirely aware and aware and aware of Oscar’s uncanny gift, who, at sunset, sipping on a cup of camomile tea, has Oscar pass by, stop, stay still for an instant, yes, just an instant, turn around, approach and sit down next to them with his head slightly touching the side of their right calf.